It's no secret that we have a lot of feelings about athleisure. Whether we're defending our right to wear leggings in or out of the gym or trying out the polarizing bike shorts trend, we're quickly learning that 2018 is the year that comfort gained real ground in fashion. What's ironic about embracing athleisure so wholeheartedly is that more often than not, we're not wearing sneakers to go running, nor are we putting on a pair of leggings strictly for a yoga class (though we do those things in them, too). With that in mind, let's get one thing clear: Jogging outfits—those matching sets made up of a sweatshirt and joggers—are the one athleisure look you can most certainly count on us not wearing to the gym. 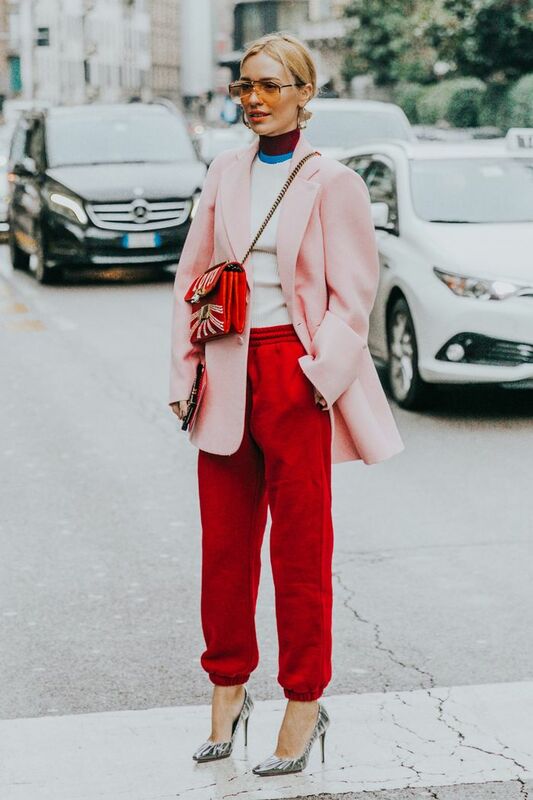 We know it's counterintuitive, but just take one look at how fashion people have taken the coordinating sweats and breathed new life into them via fresh colorways, sleek cuts, and key footwear combinations (we're looking at you, ankle boots). Need a bit more convincing? Let the following street style looks demonstrate just what we mean when we say that jogging outfits are just too "fashion" to be limited to a gym session. There's something to be celebrated about the fact that we can look at an outfit that combines joggers, stilettos, and a blazer and think yes. Lean into logos—slogans, text, and brand names blazoned across a hoodie and joggers give the look an even sportier vibe. Dua Lipa, you just convinced us of wearing our joggers with our most extra boots. Leave it to Hailey Baldwin to make a jogging outfits look incredibly sleek. Also, that shade of emerald is everything. See what we mean? With some of the year's biggest trends like a puffer coat and hi-shine boots, this jogging outfit isn't going anywhere near a gym (and we prefer it that way). This opulent shade of blue makes Gigi's tracksuit outfit come alive. On Gigi Hadid: Cotton Citizen Electric Blue Milan Set. Tuck your joggers into a pair of patent combat boots and pat yourself on the back for achieving maximum levels of comfort (and looking cool doing it). The #1 way to make the look feel cohesive is to opt for allover neutrals and keep with a singular color scheme. Of course our favorite Italian street style star just made us reimagine what a jogging outfit could look like. It seemed like Bella Hadid was getting behind the look before anyone else. Ankle boots are the one piece that undoubtedly gives a matching sweats outfit that fashion-y appeal. Luxe velvet elevates the sweatpants. Both available in sizes 14 to 22. Sweatshirt available in sizes XS to XL and pants available in sizes XS to L.
Jacket available in sizes XS to XL, and pants available in French sizes 34 to 42. Both available in sizes XS to L.
Both available in sizes 0 to 4. Jacket available in sizes XXS to L, and pants available in sizes XXS to XL.